There was something evil about the Third Avenue bus. Learning you had mesmeric powers was one thing. Actually using them turned out to be quite another. 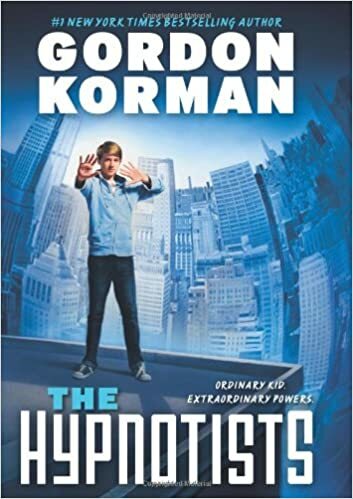 An all-new, mesmerizing adventure from the masterful Gordon Korman! Jackson Opus has always been persuasive, but he doesn't know that he's descended from the two most powerful hypnotist bloodlines on the planet. He's excited to be accepted into a special program at the Sentia Institute -- but when he realizes he's in over his head, Jackson will have to find a way to use his powers to save his friends, his parents, and his government. I like that beginning! This one sounds interesting. Hope you enjoy it! Hypnotism is always intriguing. I was hypnotized once and definitely would not want to repeat the experience! Actually, I haven't heard of this author before. So thanks for mentioning this book. Enjoy your current read! I haven't heard of this one, but it looks like it could be fun. Enjoy your weekend! That beginning surely pulls a reader in! :-) Have a great week ahead!